Don't run with lancers. Ever. The steroid fueled adventures of Marcus "Do-Rag" Fenix may be over, but the Cogs still march on. 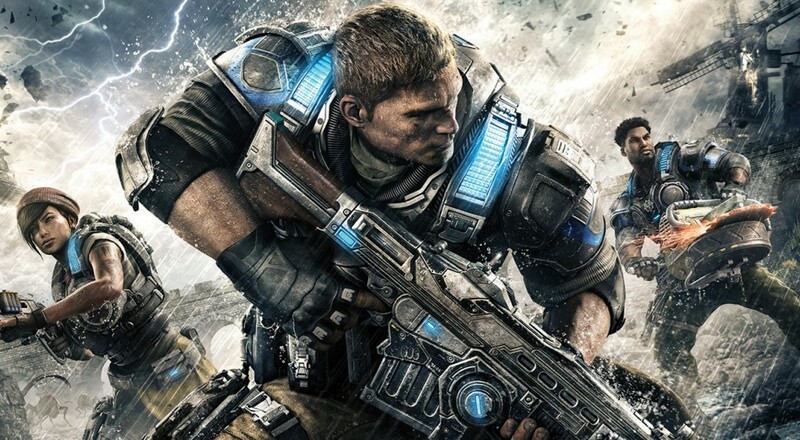 Gears of War 4 debuted at E3 2015 showcasing two brawny new characters who just love chainsawing living things. JD Fenix, son of Mr. Do-Rag himself, takes center stage while his buddies Kait Diaz and Del Walker join the cast from safety behind a fallen concrete pillar. There can't be a proper release announcement without a CGI trailer. It just isn't done! Remember the extremely poignant initial Gears of War trailer featuring Marcus sifting through rubble to the soft tones of "Mad World"? And then how the actual game lacked any of emotional resonance and was instead bro-fists and barely contained roid rage? The original GoW was great, don't get me wrong, but that particular trailer didn't quite capture Marcus' "always screaming and swearing" persona with any accuracy whatsoever. At least this one has ol' JD charging through a forest and firing backwards. Maybe he's a huge Simon & Garfunkel fan. Details on the game are still fairly light. GoW 4 takes place 25 years after the previous entry, where humanity (once again) fights for survival against the Locust Horde. Lancers are still a viable weapon, which means humanity has not yet achieved the technology to craft a gun that shoots chainsaws, much to my disappointment. We'll keep you posted on more GoW info as the months march closer to release date. Until then, maybe try splicing various Simon & Garfunkel songs over this trailer. I suggest starting with "Scarborough Faire" and maybe easing into "Mrs. Robinson." Page created in 0.3283 seconds.